A note in the programme for this production of the stage adaptation of The Exorcist demonstrates good self-awareness. “There will be people who just won’t come and see it.” And then there are people like me, who were curious to discover whether this has a definitive fright factor to it, or if it’s trying too hard, or otherwise just not very convincing. It’s certainly different, and with a cast of nine, certain periphery characters that appear in both William Peter Blatty’s novel and subsequent motion picture, are – well, exorcised, so to speak, from the play’s script. Less sometimes really is more, and this is evident from a tight production that is set almost entirely in a house being rented by Chris MacNeil (Jenny Seagrove). It’s rare for a stage show to be tighter than a motion picture, given a film’s ability to suddenly cut from one scene to the next. But this play keeps the action flowing at a reasonable pace, and the scene divisions are clear enough. By far the biggest problem is an over-reliance on volume to induce fear into the audience. Certain episodes of paranormal behaviour being exhibited in the bedroom of young Regan MacNeil (Clare Louise Connolly) are so loud that, to misquote another review of another production, I nearly spilled my wine the first time around. The thing is, audiences aren’t stupid, and there are only so many times the noise level cranks up before people are too adequately prepared for subsequent scenes. Oh well. The special effects are well done, however. The video projections have much to add to the staging. 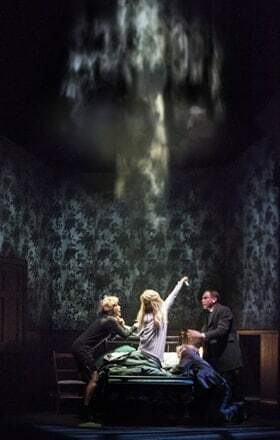 The head-turning scene (those familiar with The Exorcist in its previous incarnations will undoubtedly know what I am talking about) is impressive, and I would nominate the lighting (Philip Gladwell) for a theatre award if it were within my power. Sir Ian McKellen’s voice as that of the Demon adds much to the gloomy atmosphere. There aren’t many other voices that can provide such an extraordinary combination of cunning gleefulness and commanding fiendishness. 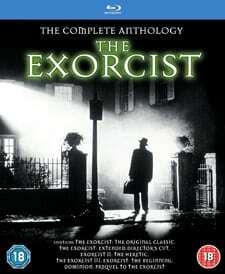 In the final scenes, it towers over the words of the exorcism liturgy being read out by Father Merrin (Peter Bowles) and Father Karras (Adam Garcia). The coarse language is perhaps not as shocking these days as it was in the 1970s – there are, I think, more expletives in The Book of Mormon musical in the West End than there are in The Exorcist. Still, as far as this play goes, even a ‘knock, knock’ joke is not immune from a rapid descent into generous profanity. It amused me that what may have been a sign of possible demon possession a generation ago is, these days, simply the way certain people seemingly naturally converse. Some details about other characters’ lives are initially superfluous but come the exorcism, these same details are cleverly used by evil forces to taunt the (legitimate) occupants of the house. At the start of the play, a sudden plunging into darkness is all it takes for some in the auditorium to openly gasp and/or giggle nervously (I didn’t detect any screaming from the audience at any point), and for them, it’s one of those shows that had them at ‘hello’. Others, though, yours truly included, may find The Woman in Black scarier as a stage production. Ultimately, at the end of the day, it does not disappoint. Connolly is perfectly cast and does brilliantly in her portrayal of a dependent child, putting in a tour de force performance. It would have been, it almost goes without saying, morally dubious to have used actual child actors for the part of Regan in this production. Of the supporting performances, Tristram Wymark’s Burke stood out for me, a dominant stage presence providing some comic relief early on in proceedings. Granted, some of it is rather repulsive. Some of it is mysterious, however, and some of it is intriguing. Accessible for those who haven’t seen the movie or read the novel whilst entertaining for those who’ve done both, this is an absorbing and admirable production. Jenny Seagrove plays Chris MacNeil opposite Peter Bowles as Father Lankester Merrin, Adam Garcia as Father Damien Karras, Clare Louise Connolly as Regan, Todd Boyce as Doctor Strong, Mitchell Mullen as Doctor Klein, Elliot Harper as Father Joe and Tristram Wymark as Burke. Some of it is mysterious, however, and some of it is intriguing. Accessible for those who haven’t seen the movie or read the novel whilst entertaining for those who’ve done both, this is an absorbing and admirable production.